How to Add Sub Accounts in iSMS - lowest price & most reliable Bulk SMS marketing tool, 2 way sms Malaysia, works with Bulk SMS Singapore, online sms solution, web sms marketing. The Bulk SMS Malaysia team realises that the ability to add sub accounts under a main user is very useful especially the main account is an expanding company. You can share and allocate credits to every sales agent's sub accounts for separate use to do SMS marketing. 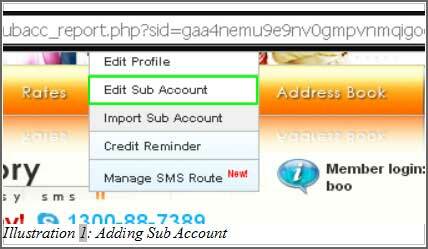 First of all, user have to login into the bulk SMS system go to Profile > Edit Sub Account as shown below. Or you may add a sub account by clicking the button in the member console..
After clicking on "Edit Sub Account", the screen below will display and you are required to fill up the sub account information as below. 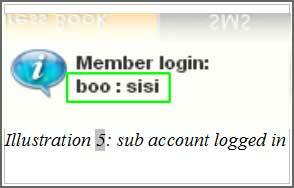 You need to fill up the username and password (for your sub account holders login purpose). When setting email, daily or monthly limit, it depends on you whether to add or not to add. For the daily and monthly limit, if you set to 0, it means unlimited usage unless you set a quota to the sub account. As the main user, you can set permissions for editing address book and message control as highlighted in the picture. You can also delete the sub account by clicking the "remove" button or edit the account by clicking the "Edit" button. Below is a sample sub account logged in and tested out limitation of SMS usage. As the main user has set the limit, the sub-user will be unable to send out messages if they have reached the limit as shown below.